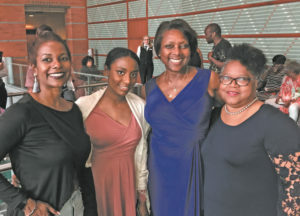 Lee Chapel AME Church’s 120th anniversary fundraising committee celebrated with the Cincinnati Arts Association’s building diverse audiences advisory committee at the opening night of Dance Theatre of Harlem at the Aronoff Center for the Arts in May. The evening started with a pre-show VIP reception, which was hosted by the building diverse audiences advisory committee (BDAAC) of the Cincinnati Arts Association and attended by Dance Theatre of Harlem (DTH), Cincinnati Arts Association (CAA) officials and committee members along with dozens of people from the Lee Chapel Group and the Cincinnati community. Steve Loftin, CAA executive director and board member, and Steve Dobbins, BDAAC chair, welcomed the reception guests. Virginia Johnson, DTH artistic director, and Keith Saunders, ballet master, described the history and mission of the Dance Theatre of Harlem and introduced the works that would be performed. Lee Chapel AME Church, at 2009 Pogue St. in Cincinnati, announced its yearlong celebration of 120 years of ministry and community service in O’Bryonville, Evanston and Walnut Hills. It is inviting the Greater Cincinnati Community to join the celebration. Led by Pastor Kevin Cooper, the anniversary theme is “Remembering our Past and Reveling in Our Future,” based on the theme scripture Joshua 4:20-24. The church plans a series of community events to celebrate its 120th anniversary and extend its ministry through evangelism and community service. Events include theater outings; a celebrity golf outing; four weeks of free softball clinics for community youth, culminating in a community softball game between the Lee Chapel All-Stars and the Cincinnati Sentinel Police Association; fashion show extravaganza; monthly family movie nights; fish fry events; a parade and kick-off event; a revival; concert featuring gospel recording artist “The Prince of Praise” Byron Cage; a celebration banquet and anniversary Sunday service program and dinner. Visit https://leechapelamechurch.org and the church’s Facebook Page at https://www.facebook.com/TheLeeChapelFamilyfor more information and updates.